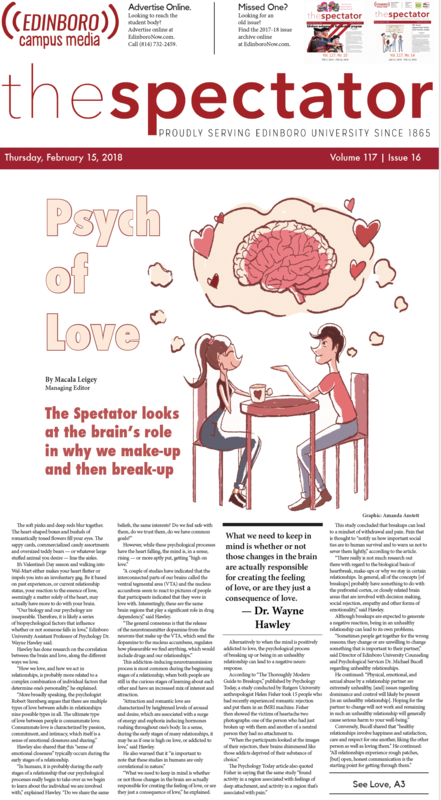 The Spectator looks at the brain’s role in why we make-up and then break-up. Recently opened by a local couple, the Edinboro Market is on a mission to deliver locally sourced goods and produce to the community. 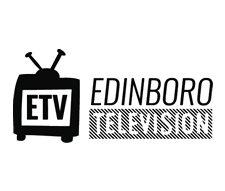 The Edinboro women’s basketball team came away with a 63-42 win over Gannon. On the men’s side, Edinboro fell in a last-second upset, losing 72-71. Between high energy basketball games, Edinboro University athletes took a moment to grant a girl’s wish. On Feb. 5, East Stroudsburg University announced the “Warrior Promise,” a program that will freeze tuition for incoming freshmen beginning in Fall 2018. The Step Afrika! dance company performed at Edinboro University on Feb. 10 in honor of Black History Month. On Feb. 8, Edinboro University hosted its most recent installment of the Social Equity Distinguished Lecturer Series. Ultimately, “Little Dark Age” is a technically fine piece of music from one of the most creative bands this side of the millennium, but it serves more as proof of concept for where the band wants to go in the future, not as a solid album. Margaret “Meg” Schettler is a senior animation student at Edinboro University. All components combined, “Paddington 2” is just shy of magical. Throughout the entire movie, smiles were brought to faces and this viewer was fixed on the beloved protagonist. “Dr. J” Jay Hanes’ art education field class organized a PhotoVoice research project, currently on display outside of Doucette G-5. The second half of Good Tiger’s sophomore album is much more dynamic than the first, but for a “supergroup,” very little sets this album apart from other alternative metal releases. Edinboro’s wheelchair basketball team won three of their four games in a tournament hosted by the University of Illinois on Friday and Saturday. This year, nine additions to Edinboro University’s football team were announced on National Signing Day. Current and former Edinboro wheelchair basketball players competed against 22 other players for a spot on the 2018 U.S. Men’s National Wheelchair Basketball Team at the Olympic Training Center. 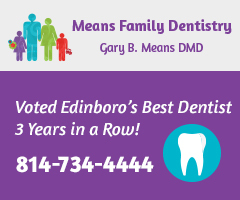 As winter continues to grasp Edinboro in its clutches, many of us are sure to be experiencing some level of depression, whether it be simply sleeplessness and overeating, or something worse like social withdrawal. The purpose of this exclusive look into their lives is to inspire us average “Joes” on the couch that such dreams are possible, even for those who come from humble beginnings. Interview with Edinboro basketball player, Keshawn Liggins. The melodies are similar to each other and the songs can be hard to tell apart due to their similar message, but Duchovny’s soft voice makes the album easy to listen to. On Monday night, it was announced by EUSGA that the position of Vice President of Student Interest had been filled.